Originally posted here on PsychCentral. 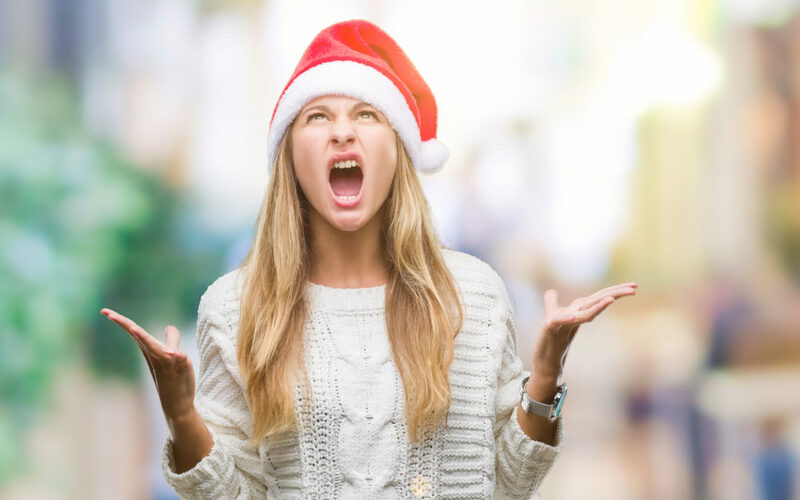 Once again, the holiday season is upon us… And, unless you’re under the age of 5, there isn’t a more stressful time of year! The holidays can bring out the best, and worst, in us. That’s because we can be our least mindful selves when we’re around our longest standing relationships. Why? Our minds and bodies enter into automatic communication patterns. We’re in our comfort zone. Things are just so familiar. So you end up saying the things you always say. Your mom responds the way she always does. And before we know it, the fireworks begin! Even with our best intentions, our emotional habit patterns inevitably surface. The odds are NOT in our favor. But wait! We have a skill to help you be more effective! Although you can almost guarantee That Thing You Do will show up, you have a choice in how you respond! So read on, Mindful-Master! And let us know if something sounds familiar. Have you ever felt like you were cruising along, totally in control, then suddenly you hit one bump in the road and it seems like everything falls apart? Bridget knew this troublesome pattern all too well. Until, she gets a call. “Aunt Lois’ house is being fumigated. We’re having Christmas at Cousin Cheryl’s.” Bridget’s face turns bright red. “No, no, no!” She starts pacing back and forth, fists clenched, eyebrows furrowed. She slams the door, leaving her boyfriend shocked and concerned at how quickly she could unravel; from cool and collected to hot and bothered. From the outside, this rapid shift seems to come out of nowhere. But there is always a series of interactions on the inside, which occur between the outside trigger and behavioral reaction. Let’s take a peek within, shall we? Bridget’s baseline low tolerance for uncertainty and inability to effectively adapt to change, compelled her to try to control every possible outcome. But, because we cannot predict every possible outcome, when that strategy inevitably broke down, so did she. As we’ve seen in this series, skillfulness begins by building objective self-awareness of our own ‘Thing’. We do this by identifying our unique habit patterns as they show up within the Emotions – Thoughts – Actions (ETA) system. We can let go of being so hard on ourselves when we recognize this is just old programming playing out on normal human hardwiring. We can begin to insert skills to short circuit the system from spiraling out of control! These thoughts only exacerbated Emotions such as anger and anxiety. In addition to physical sensations like hot flashes, chest pounding, and agitation. In a desperate effort to get rid of the discomfort, Bridget would cry, yell, and unload her emotions. Freaking her boyfriend out, and anyone in the vicinity! Once recovered, she would flop back into over control mode by avoiding (Action impulse) the situation, and thus her emotions, entirely. See how this can go? This was Bridget’s emotional habit autopilot at it’s most intense. The Skillful Alternative: Would You Rather Be Right? Or Be Effective? Does adding judgments, or saying that things are bad or “should” be different change the situation? Or just cause you more suffering? The anecdote to getting unstuck from this flip-flop pattern, is to let go of “shoulding on ourselves” (and everyone else) and focusing on what works. Easier said than done, right? Are you willing to give it a try? To increase effectiveness, we need to ask ourselves, “What is my long-term goal?” For Bridget, it was to have a pleasant Christmas with her family. Then you need to ask yourself, “What steps do I need to take to get me closer to my goal?” Bridget needed to accept the change in venue and adjust to her current circumstance. Step I: Identify a situation in your life where frustration, unhelpful anger, or righteousness are keeping you from being effective. Step II: Ask yourself, “What is my goal?” “What do I want long term?” Consider your Values for guidance. Step III: Ask yourself, “What action do I need to take to get me closer to that goal? Identify one doable action you can take today and do it! Step IV: Pat yourself on the back! Being effective is really hard. Pro tip: Although we might not always get what we want, we often feel better about ourselves when we act effectively. Notice that you don’t have to carry the added embarrassment from having acted ineffectively. So as best you can, focus less on the outcome and more on the pride that comes with acting according to your Values. This will lead to more success in the future! Sharing is caring this holiday season! So let us know how it goes in the comments section below. Who knows, your effectiveness may inspire effectiveness in someone else in need! This blog is inspired by Dr. Fielding’s upcoming book: Mastering Adulthood: Go Beyond Adulting to Become an Emotional Grown-Up, which includes QR code linked skill videos to guide you on your journey of self-discovery and emotional self-care! To get the blogs, AND a free skill video, straight into your inbox, sign up for the Mindful-Mastery SKILL WEEKLY newsletter. Or check back here in two weeks for the next post. We can also hang out on Facebook, Twitter, or Instagram. Or YouTube for skills videos! Ohh great. Thanks for sharing this info. Very very impressive.